From the beautiful, lush greens of SHIRE, at bottom, to the pale, lunar lavender of MOONSTONE at top, you'll find a color that makes you shiver in tosh silk lace. tosh silk lace is a stunningly silky 100% pure tussah silk yarn. Slightly dry, fluid, the colors reflect the light beautifully. This lace yarn is a stunning 1,000 yards. Just amazing, and worth every penny. 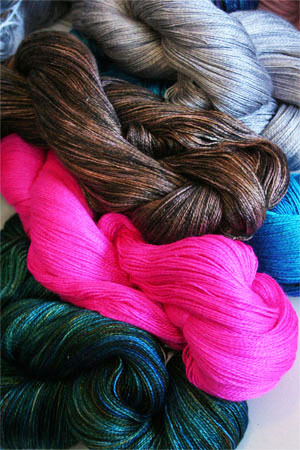 We carry a limited color range, but you may special order any color madelinetosh carries.